I took the Suntech TenkaraBum Traveler 44 to Tasmania on a 10 day cycling/fishing trip. I had a couple of shorter rods for backup and for scrubby creeks. I mostly fished the rod at 44 length but also fished it at both shorter lengths. I only fly fished with the rod and here is a brief review. I actually snagged a large twig on the river and pulled it in easy before I had hooked fish. I could feel the power of the rod when I pulled the snag from the river. I knew that the rod could handle a good size fish but probably not enormous. This gave me confidence in the rods ability. I started catching small fish casting with a level line at the 44 length. At 44 it has a lot of character and good flex. It feels like a really nice keiryu rod which casts nice and accurately. I like the 44 length as it helps keep the line off the water and gives a little more distance when wading up or downstream. Also 44 is a nice length for keeping the line off low shrubs and grasses when stalking feeders at the rivers edge. The 40 length is the sensible one of the family. It actually feels like the most common sense rod I have used for trout anyway. The action just seems to be just right and the length at 40 seems to be the right all round length and action for a general medium sized trout stream. I did hook a really nice fish at the 36 length. At 36 it has a very fast action and feels very much like a quick action tenkara rod. The fish caught was quite close and as I sight casted to it, it took the fly and then went berserk. "I thought brown trout didn't fight hard" I said to myself as it swan under a nearby bridge and tried every trick to loosen the fly from it mouth. After hooking it at 36 I extended the rod to 44 for a bit more run and had the fish soon at the bank after pulling it out of several snags. The 44 Traveler is a great rod with plenty of power and versatility. It has a lovely finish and I recommend for intermediate to experienced fixed line fishers. The rod length changes are locked in with a firm push and slight twist and hold nicely. I like the 44 length because I like the character of that length with the whip & flex but can imagine a lot of fly fishers would prefer the 40 length for the sensible more perfect action at this length. Thanks Chris for making this rod available. It will catch a lot more fish. This will be my new go to rod for general tenkara fly fishing. I changed all of Dean's Travellers to Traveler. There are two accepted spellings of the word traveler. In the US, it is generally written with one L. In the rest of the English speaking world it is generally written with two Ls. TenkaraBum Traveler is a proper noun, so at least on these pages it will always be capitalized and will always have just one L.
As Dean found, though, for travelers in the US, and for travellers in the rest of the world, it really is a nice rod! I really enjoy the reports from other countries. Perhaps you could post some photos in future articles that show more of the countryside and streams. Tasmania just sounds like a great place to fly fish. Thanks again. I should have looked at the wording on the rod, oops. Hi John, I will put a small report with nicer photos in trip reports. I did add 3 more photos here and the one with the small fish was the only one uploaded. That's a bit of a dud photo there. 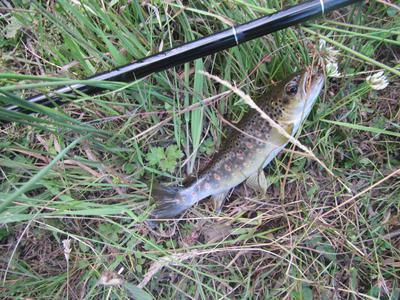 Check out a few nicer ones and more of the story in 'Your Tenkara Stories'. Tasmania is good for tenkara and nice in January. I enjoyed both of your stories. Please share more. I have the older version, the Keiryu Special 44. According to Chris the only difference is the paint job. I wish I would have had mine yesterday on an exploring trip to a new area. The zoom feature of the Traveler 44 is one of the best. I fish mine at 40 and 44 most of the time. Dropping down to 36 when things get tight is so nice. Oh, and it was nice to see the green of your summer! Now that I have mine back from my son, I need to fish it more.